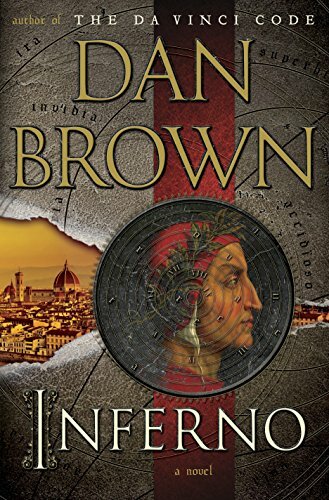 Dan Brown’s Inferno starts out sizzling and rapidly heats up with a great twist, only to fizzle out by the end. The author of a little book called The Da Vinci Code, Mr. Brown employs many of the usual techniques that made his book a bestseller. He provides elegant descriptions of European cities while bringing their history and culture to life, and he writes for an ADHD attention span. Even two-page chapters can shift scenes within them. This adventure moves swiftly from the beginning. Harvard professor Robert Langdon must interpret mind-bending symbols and word play patterned after The Inferno of Dante’s Divine Comedy. Only this time, Langdon wakes up in a hospital bed in Florence, Italy, with no idea how he got there and unsure of his mission. When an assassin storms toward his room, young doctor Sienna Brooks all too conveniently gets Langdon out of a jam. She’s a former child prodigy with many secrets, all too eager to help Langdon resume his search for . . . whatever he’s looking for. He can’t remember, but his dreams tell him it’s a matter of life and death. It appears that Langdon is out to stop a global plague, the second coming of the Black Death. Renegade geneticist Bertrand Zobrist created a nasty surprise to further his goal of dramatically reducing the population. Instead of tackling religion, this time Mr. Brown’s novel focuses on the dangers of overpopulation and the belief by some scientists that it will cause a near extinction of humanity. In place of controversial groups within the Catholic Church, the book explores the Transhumanist (H+) movement among scientists who believe that humanity must evolve into something greater through medical engineering. This can’t happen if overcrowding leads to humanity’s premature demise. Zobrist doesn’t stick around to see how his plan plays out. The book opens with his death. Of course, since it’s a Dan Brown novel, he left Dante-inspired clues that only Langdon can decipher that might allow his scheme to be foiled. Along the way, Langdon must avoid a mysterious squad of soldiers out to stop him and stay on his toes for Zobrist’s supporters. Still, the novel lacks a true villain opposing Langdon; and the threats to his personal safety seem hollow. The tension comes from the race against time to stop Zobrist’s plague from being disbursed. Mr. Brown crafted a well-played twist into the story that turns the relationships between some key characters upsidedown. Just when things seem headed toward an exciting conclusion, the air is let out of the balloon with yet another twist, one that sputters. I’m not going to spoil it, but I’ll say that it lowers the stakes and makes Langdon’s adventure seem like a waste of time. It felt like watching a long-awaited, much-touted extreme martial arts match end in a tie. At least I learned something about Dante, Florence, and the H+ movement—and it was more fun than a typical history lesson. Brian Bandell is the author of the science fiction thriller Mute, and a thriller, Famous After Death. He is also a journalist at the South Florida Business Journal, where he has won over 20 awards for his writing.